There is a bucket full of superlatives that are time and time again associated with these beaches, but the simple and honest truth is that they are simply stunning and few beaches anywhere in the world can upstage them. Of course, being close to El Nido, there are thousands of pictures that are online that visually demonstrate, some better than others it must be said, their beauty; caster sugar white sand, lined by palm trees, glass clear water etc. All the hype left me wondering was there any point to a visit just to add my name to the lengthy list of bloggers who have already been there, seen it and done it, but ultimately I feel back on the adage, don’t comment until you have experienced it for yourself – here I am. Aerial shot of Calitang Beach (left) and Nacpan Beach (right) facing El Nido Bay. So where are these miracles of nature and how do you get to them? As far as what they are called the header gives you a clue, but as to location they are about 17 kilometers north of El Nido or, in motorcycle ride terms, around 90 minutes ride – it’s not that the bikes go really slowly, it’s the roads are not of a superb standard. The beaches run into each other and are made up of a stretch of jaw-dropping pristine sand that stretches into the distance, Nacpan for around 4 or more kilometers. It is fringed like a well-plucked eyebrow, with coconut trees straight out of a novel of castaways or Treasure Island and, still thankfully, not saturated with so many tourists that would give you the impression your on Muscle Beach in San Francisco. The southwest tip of Nacpan is where it meets with the smaller Calitang Beach, and if you scramble up a small hill at this point, you get a wonderful and sense of scale to the surroundings. It is also a great spot to do the family/friend pics or the selfies-on-a-stick and if you have already seen some pictures of this place, this is where they have been taken from. As said, this is still relatively free of mass tourism and there are no high-end resorts in the area, only some small time cottages, and huts for those adventurous enough to want to spend the night there but be warned, although wonderfully romantic it’s basic with just a few local stores and places to get something to eat the fringes or a little more inland. Lio is unlike any beach in El Nido. Its 4km long of beautiful sand and is a brilliant place to swim (even surf sometimes, depending on the waves), relax and for the romantically inclined, watch often spectacular sunsets. Although it is open to the public, it never seems to feel it’s crowded at all, although I guess there may be exceptional days. Another asset of the place is that while you can enjoy a day of sun, sea, and sand, there are also other things to see and do in the same area, such as renting bikes, kayaks, frisbees and so on as well as taking part in other water sports. When you are done with soaking up the sun and swimming your heart out, you can use some great spa services before having to choose from an amazing variety of restaurants that cater for all tastes, such as burger bars, pasta, pizza, fusion international, Chinese, Filipino and of course, proverbial beach bars that serve imaginative and refreshing cocktails! And finally, there are the souvenir shops for all your relatives and friends at home that expect something! Merimegmeg Beach Is a great place to go with few really good bars and ideal for relaxing under a mango tree. The imaginatively named Marimegmeg Beach Bar is probably the best place to hang out while you are there and the food and drinks they serve are brilliant. While you are enjoying yourself there, listening to the cool music and being pampered by the excellent staff, be sure to hang around for the often spectacular sunsets; the place simply has a reputation hard to beat for fun, relaxation, food and drink and Hollywood style sunsets. There are other different places you can discover during an inland tour: Makinit Hot Springs, Taraw Cliff, The Ille Cave, and Nagkalit-Kalit Waterfalls. These places are free to access and you can go there on your own. With a tricycle: The price for 2-4 persons is around Php 1000 (Kuya Danny, 09183431892). The trip will take you around 1 hour. Know that it will not be a comfortable one since half of the road is in a very bad state. It can even get really muddy if it has been raining in the previous days. With a motorbike: You can rent a motorbike and go to Nacpan Beach by yourself. Most people find it more convenient than hiring a tricycle. It’s also cheaper since you can rent a motorbike for only Php 700/day. 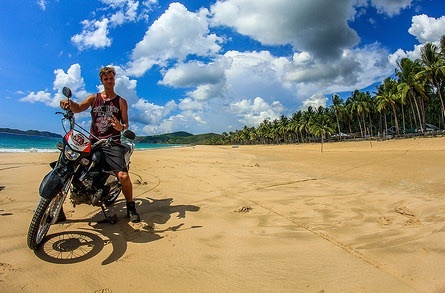 With the Inland Beaches and Waterfalls Tour (aka El Nido Tour E): The last option is to visit Nacpan Beach while doing Tour E. You will then have motorbikes and a tour guide with you. Nacpan Beach will be one of the stops during your day. You can book this tour online by clicking here. Where to get cheaper Palawan tours? 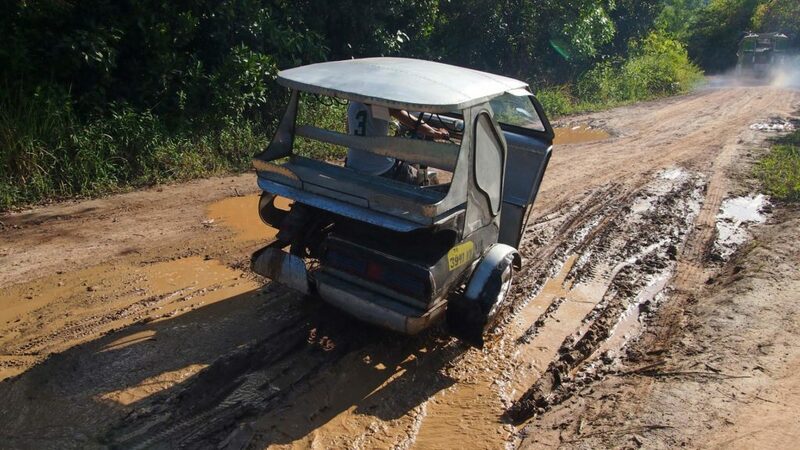 Like in many places in Palawan, the roads are not made up and you will find lots of dirt roads full of potholes and worse and when it rains they can turn to mud. In fact, the first time I went to Palawan, Google maps very kindly guided the car I was traveling in onto one of these roads between Puerto Princessa and El Nido. Luckily it was dry and apart from adding an hour or so the travel time, it was more of a horror experience for the suspension of the car! The reason I mention this now is that the road to these beaches is one of the dreaded dirt roads, so you really want to make sure that you have an experienced driver who knows what they are doing and has previous experience in taking people to these beaches. If you think it is bad at the start it only gets worse the closer you get to the beaches and be prepared to get off your bike and help push, especially if it has been raining and the road is covered in some deep mud patches, but it is worth it and although you might feel you have been in a wrestling match with a bear by the time you arrive, it really is worth the discomfort. If you want to stay overnight in Nacpan, you can camp out at Jack’s Place (+63 907 344 9337). Just take your own tent and you pay only Php 150 per person per night. If you do not have one you can rent a tent from them for Php 500, which gets you a tent big enough for two, a mattress, pillows, and a blanket. Another option is, Hammock Homestay (+63 917 665 6614 or +63 939 271 2120 ) is actually 450 per night per pax, Breakfast included (Pancake + 1, and only 1, coffee/tea), even though you’re a couple sleeping on the top of the tree house. It’s definitely NOT as good value if you are two or more as you can find front beach bungalows for as cheap as 800 per night. There are also rooms at Nacpan Twin Beach on the southern end, with rooms from between Php 600 and Php 800 per night which gets you basic fan room right on the beach front. You can find other alternatives to booking sites; at least 3 or 4 places offering rooms. If you prefer you can also wait until you are there and just walk in and ask for a room. A charming little village named Calitang is located there but has very little in the way of amenities, so if this is important to you it is would be best to stay at a hotel/resort in El Nido Town Proper where you will have access to lots of restaurants, bars, tour operators etc. Most tourists go to Nacpan Beach on a day trip only and return to the town proper by end of the day.